Large-size picture frame frees digital photos, videos, art & music from the shackles of a computer and brings them to the big screen. 15-inch eMotion Digital Picture Frame. MediaStreet Inc., a leading independent manufacturer of archival-quality inks with matched inkjet media and other innovative, digital solutions for the photographic, arts and consumer electronics industries, is introducing the ultimate viewing experience with its new "15-inch eMotion Digital Picture Frame." The announcement comes on the heels of the company's recent introduction of a Bluetooth-enabled digital frame, and soon to be announced WiFi Frame, reinforcing MediaStreet's expanding leadership role and dedication to the popular digital picture frame market. The new 15-inch eMotion frame provides an extremely high resolution (1024 x 768), 15-inch (4:3 aspect ratio) Digital TFT LCD panel for clear, sharp picture quality that brings viewing photographs, art and video to a whole new level. "The 15-inch eMotion Digital Picture Frame has the classic and stylish look of a traditional picture frame with real wood molding, but when you power it ON, that's when the similarities end and your digital files come to full eMotion life," shares Asia Lee, MediaStreet's Directory of Sales & Marketing. The new eMotion Frame offers consumers tremendous flexibility by supporting virtually all video, music and photographic formats including MPEG 1 / 2 / 4, AVI, MP3, WMA, JPEG and BMP. The camera cards that the frame supports are SD/SDHC, MMC, CF, MS and xD. In addition, the new digital frame provides a built-in USB port which gives users the ability to download images, music, video or photos from memory card readers or directly from their computer and USB Flash drives. The Frame has a desktop stand, or can be mounted to a wall with an enclosed wall bracket. 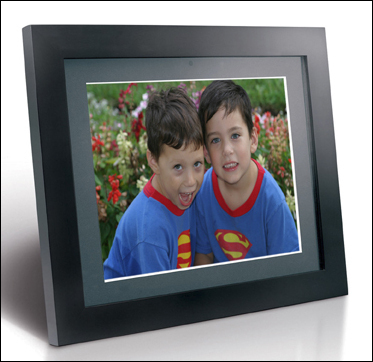 MediaStreet's 15-inch eMotion Digital Picture Frame will be available June 25th and have a suggested retail price of $298.00. "For me, there is nothing more satisfying than to allow all of the photos that I snap -- not just hand-picked ones that we normally print -- to escape my camera and appear on a larger-than-life Digital Picture Frame for everyone to enjoy," says Norm Levy, president of Media Street. "If you are passionate about your digital photos music, videos and art like I am, the 15-inch eMotion will give you goose bumps every time you turn it on! "At MediaStreet, we continue to develop ways to free your digital files from the shackles of the computer screen to a more attractive, traditional-looking venue, such as a Picture Frame," Levy added. The 15-inch eMotion allows the creation of customized slideshows -- with your favorite music -- by using a variety of special effect transitions. Users can also alter the transition speed between photos and can set the slideshow to play Random Picture Shuffle or just Favorites. Slideshows can be produced directly from images located on an external memory card or from the unit's 256MB internal memory. Feel free to Pan, Zoom and Rotate your photos as well for a truly unique and creative presentation to share with friends and family. Your home-made videos, as well as commercially available music videos and movies can be played on the digital picture frame. Supported formats include AVI and MPEG 1 / 2 / 4. By selecting "repeat," users can instantly create a video loop for continuous play of their favorite videos. Music from nearly any audio format is heard crystal clear through the picture frame's built-in stereo speakers. Music can be listened to privately by inserting headphones into its audio jack. By using the Color Adjustment function, users can easily adjust the Brightness, Contrast, Color and Tint to maximize viewing in nearly any environment. If all of that isn't cool enough, you can set the 15-inch eMotion to turn on and off at any time from within the set-up menu. The Frame also offers clock and calendar functionality. MediaStreet's 15-inch eMotion Digital Picture Frame comes complete with a stand, power adaptor, USB cable, remote control, User's Manual, and access to free professional photographic, music and art content at http://www.MyDigitalContent.com. MediaStreet, Inc. is a leading manufacturer of digital photography solutions for hardcopy prints and the viewing of digital photographs with its award-winning line of eMotion Digital Picture Frames. Among the company's unique advances is the marriage of digital content to its digital convergence electronics with the formation of two power web portals; one for professional photography to be enjoyed on its eMotion Frames http://MyDigitalContent.com and the other, http://Beyond.fm, to find intriguing radio shows, music and videos all of which can be played and enjoyed on the growing line of eMotion electronics including (musician) branded eMotion MP3 MP4 PMP DVD and Digital Picture Frame products. MediaStreet is headquartered in Deer Park, New York at 44 W. Jefryn Blvd, Unit Y, 11729. For more information about MediaStreet and their extensive line of products and services, please visit http://www.mediastreet.com.